It's based on a fairly simple modification of an SB draft that I've already made up a couple of times. Normally when constructing an SB waistcoat, I'd tape the entire front edge from the shoulder line to point 39. However for the DB version, I'm not sure whether I should tape any further than point G. Does anybody have any thoughts? Also, if I should tape the front edge G - H, how should I manage the corner at point G? I cant make out the diagram in the original post it is too blurry! Sorry, do you mean the image in my post, or the post over on the other forum? Taping is for achieving a nice crisp edge and to prevent any stretching in the bias areas. The whole edge is on the bias, so it would be too stretchy without taping and would loose it´s shape very soon. So tape it from the neckband to the turning point (point G?) 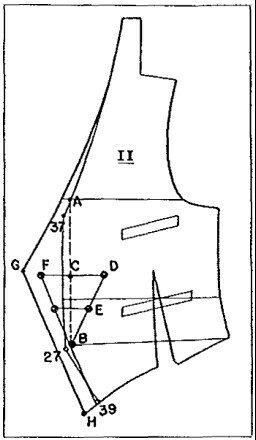 and futher down to the hem point(Point 39?). Just clip the tape at the turning point like you would at a lapel corner to keep it less bulky. Thanks peterle, that makes perfect sense! Hmmm.. those images I posted in that post were originally pdf links, but now they are tiny images! Need to fix that. Iron Work on a waistcoat?